Chris Mills has been “in the biz,” the plumbing business, for twenty-seven years. He started working with his father after he graduated high school. Over the years, he has worked for multiple plumbing companies and gained valuable experience. Six months ago, he took that experience and opened his own plumbing company, Precision Plumbing, serving Maryland and Pennsylvania. “I got to the point that I was tired of making other people money, and I decided it was time to start making my own,” said Chris. Chris is keeping up the tradition of a “family business.” His only other employee is his son, Indy. Indy, a college student and a wrestling coach, works part-time with Chris. Chris’ intention is to keep his business small and focused on serving the community on a smaller scale. Being just a two-man business, customer service is a major point of interest for Precision Plumbing. As a small company, with lower overhead, he is able to offer fair rates and 24/7 service. If there is a plumbing emergency, he is available at all hours of the day and night to control the situation. Chris also offers a 10 percent discount to both seniors and active military personnel. Chris genuinely cares to serve and give back to his community. Chris explained that water treatment involves, “Filtering the water to take out any calcium and neutralizing the acidity in the water.” You’ll notice calcium as a crusty build-up on your drains. With this build up, your clothes may be “hard” and your skin and hair may be dry. If you’re in need of water treatment, give Chris a call! He will be happy to help. He also does the repair, replacement, and installation of faucets, toilets, water lines, well pumps, and so much more. Contact Chris at 717-778-8429 or by email: precisionplumbingmd@yahoo.com. Check out Precision Plumbing’s advertisement on page 4. 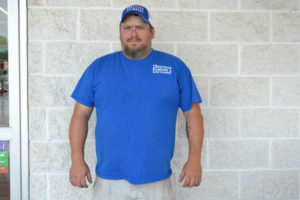 Pictured is Chris Mills, owner of Precision Plumbing.